What an elegant pair of cufflinks! 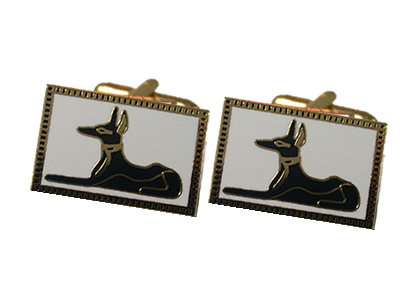 Anubis cufflinks are done in high quality enamel with gold plating. This is great funeral director gift or Egyptian collectable. For a limited time, we will be offering a free gift when you order all three items. If you purchase the Anubis cufflinks, tie bar, and stick pin all in one purchase, we will ship an Anubis letter opener ($20 retail value) for FREE!